HARI revealed four all-new vehicles: the Veloster Turbo, the Santa Fe, the Ioniq Hybrid, and the Kona. Easily recognizable for its asymmetrical 2+1 body style, the all-new Veloster merges the design appeal of a coupe with the practicality of a hatchback. The all-new Veloster features higher-volume fenders and wheel arches, pushed-back A-pillar, and lower roofline. The front has Hyundai’s signature hexagonal grille and LEDs for both the daytime running lights and headlights. At the back, it continues with its signature center-exiting tailpipe highlighted by LED taillights. Powered by a 1.6-liter T-GDI engine, it generates a maximum of 204 horsepower at 6,000 rpm and 265 Nm of torque at 1,500 to 4,500 rpm. This powerplant is mated to a 7-speed dual clutch automatic transmission. Other standard features include power folding side mirrors, a power adjustable driver’s seat, automatic climate control, an 8-inch infotainment system display, Smart Key entry with push-button start/stop, 6 airbags, and a rear camera with dynamic guidelines. There are 12 colors available with a suggested retail price of P 1,798,000. The 2019 Hyundai Santa Fe features a bold, new look highlighted by the brand’s new Cascading Grille design. The angular front face is made even more unique with the split-level Composite Light design which places the LED daytime running lights atop the LED headlight cluster. In profile, this mid-sized SUV features a bigger greenhouse (for improved visibility) while a strong character line that goes from the headlights to the taillights provide a taut shape. 19-inch alloy wheels with a diamond cut design complete the look. Inside, the Hyundai Santa Fe goes for a horizontal motif filled with more premium materials. The center-mounted “floating” screen has been tilted and positioned to reduce glare while the instrument cluster itself has been given a three-dimensional appearance. Hyundai has gone through lengths to bring up the Santa Fe’s room including the reduction of door map pockets and the relocation of the window switches. As with the previous Santa Fe, it has a 7-seater configuration. Under the hood, the Santa Fe features a 2.2-liter CRDi diesel engine making 200 horsepower and 442 Nm of torque. This is mated to an 8-speed automatic. Along with the advanced drivetrain, the 2019 Santa Fe also has improved handling and riding comfort thanks to detail changes done to the suspension. The biggest change is that the rear shock has been moved to an upright position improving its performance. Standard features include leather seats with power adjustment for the front row, dual automatic climate control with rear vents, a 7-inch display infotainment system with 6 speakers, 6 airbags, Smart Key with push-button start/stop, and rear camera with dynamic guidelines. Available in just 3 colors, the 2018 Santa Fe’s retail price is yet be finalized. However, it will likely be priced around P 2.5 million. The Kona joins the Creta, Tucson, and Santa Fe in Hyundai’s growing line-up of crossovers. 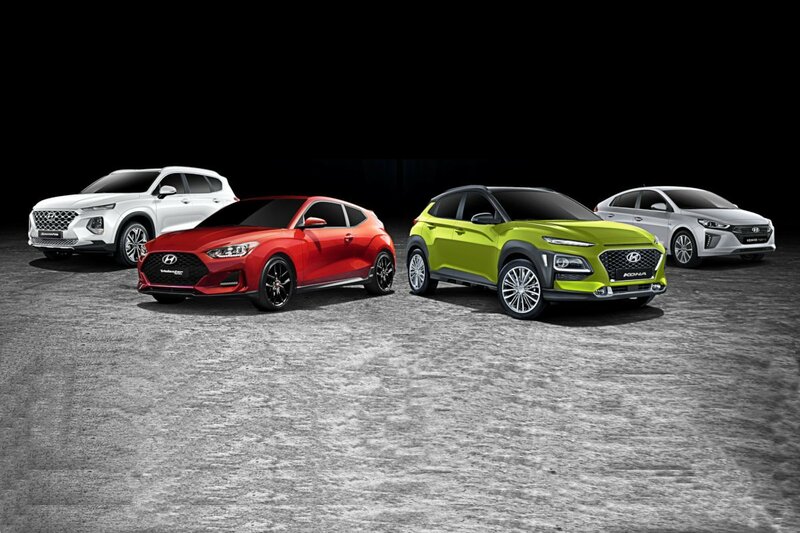 It features a bold and daring design, a hint of Hyundai’s new design language. Front and center is the new Cascading Grille with a sporty mesh pattern. Hyundai is quick to add though that unlike their past design themes, each model will have elements unique to it. In the case of the Kona, it’s the protective “armor” seen all around. The simple interior contrasts greatly with the bold exterior. The horizontal layout creases a wide and spacious feel. It offers generous interior space for its size thanks to the optimization of its drivetrain the suspension, and exhaust system all designed to reduce interior intrusion. It also enables the Kona to gain a lower floor height and an elevated seating position, characteristics both desired by typical crossover buyers. A 2.0-liter MPI Atkinson cycle engine is the only engine for the Kona. In this guise, it produces 149 horsepower and 179 Nm of torque, good for a 0-100 km/h time of around 10 seconds and a top speed of 194 km/h. This is mated to a conventional 6-speed automatic. With five colors available, Hyundai has yet to finalize the pricing of the Kona. However, indications point to somewhere close to P 1.1 million. 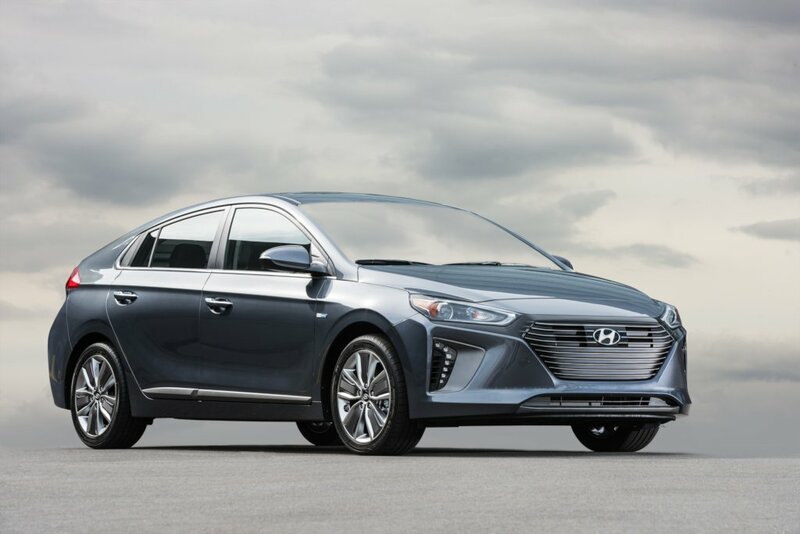 The Toyota Prius is finally going to have some competition in the form of the Hyundai Ioniq. Employing efficiency and technology in its design, it offers an industry leading 0.24 co-efficient of drag. Ensuring that form and function evolve together, the Ioniq has a fluid exterior shape that emphasizes aerodynamic body lines and design forms. Developed for high energy efficiency without compromising driving performance, the Ioniq powertrain represents a unique and uncompromising solution towards a cleaner means of mobility. It packs a 1.6-liter CVVT 4-cylinder engine making 105 horsepower and 147 Nm of torque and married to it is a 43.5 horsepower, 170 Nm Permanent Magnet Synchronous Motor. Power is transmitted through a 6-speed EcoShift dual-clutch automatic. Both efficient packaging and a low center of gravity were taken into consideration as the battery system is located underneath the rear seats so that the passenger cabin and cargo area is uncompromised in the Ioniq Hybrid, offering a total interior volume bigger than its Toyota rival. With 4 colors to choose from, the Hyundai Ioniq Hybrid retails for P 1,498,000. Laki nman santa fe 2.5m. Walang budget variant? That's the perfect representation of a mazda fanboy. Just as I imagined. Another variant of the fanboy may look like that Richard Joash Tan. Mazda fanboy? They only speak english duhh. He's not one of them. And practicality would be the last thing on his mind, unlike the other fanboys who prioritize practicality above all else. Also proclaiming fun to drive and zoom zoom while on it. Nag get together kami ng mga friends ko and hindi maiwasan na may sudden jolt. you have to endure the pain. Kaya nag-sensodyne ako! Any plans for the 1.6 turbo on the kona? Sir uly, based on specs alone which do u think is a better buy, kona or vitara? When the patrol royale was launched back in 2010, the former distributor priced it at P5.375M. Upon realizing that the royale was lost in oblivion, it is now priced at P3.7+M. Please don't repeat the mistake HARI with the santa fe.